With the improvement of special effects in cinema, directors are constantly trying to make their films look more lifelike, and transport their audiences into a fantasy world which looks like it could really exist somewhere. In all of this, it’s hard to forget that sometimes the simplest things can still be the most entertaining and innovative of all. 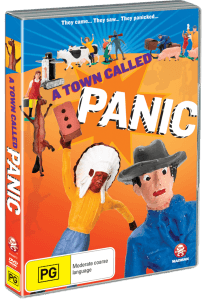 A Town Called Panic was released in Belgium in 2009 (it’s what many would describe as a cult classic amongst the rest of us), and doesn’t use the latest in CGI and motion technology. It doesn’t feature the world’s most famous voice actors, the best animation studios, and a poetic, poignant storyline…but it is precisely because it doesn’t use any of this that it works and is one of those films with eternal universal appeal. The storyline centres around three characters who live together in the town called Panic: Cowboy (Stéphane Aubier), Indian (Bruce Ellison), and Horse (Vincent Patar). One day, Cowboy and Indian realise they have forgotten Horse’s birthday. They quickly brainstorm ideas and decide on a present, but their present backfires and sends them on a journey to the most inconceivable of places. Along the way, other villagers from the town have their own small stories including Steven the farmer and Madame Longray, Horse’s crush. 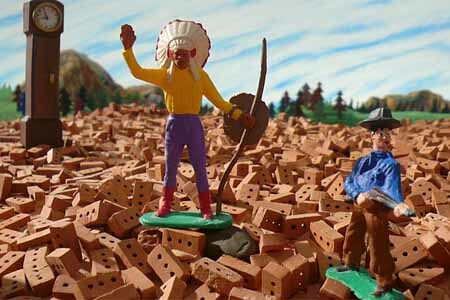 Let’s put it this way: Panic is basically Toy Story 3 on really, really, really strong crack. The trailer claims the film is “more terrifying than Psycho, more romantic than Casablanca, and more spectacular than Journey to the Centre of the Earth”, and the only way that Panic managed to put elements from all of those films is with a world where the imagination rules. To say that the storyline of A Town Called Panic is impossible is to say the Pope is Christian. From the start, Cowboy, Indian, and Horse live in a world where anything can happen – and everything does happen: the hilarious, the sweet, and the downright odd. However, it’s this impossible storyline which brings to life the world that we as kids dreamed was possible; the world isn’t limited by anything but the depths of the creator’s imaginations. Aubier and Patar took the most mundane routine of life and transformed it into a world where imagination reigns supreme over logic, and the outrageous just becomes normal. The story is a journey you have to take yourself. 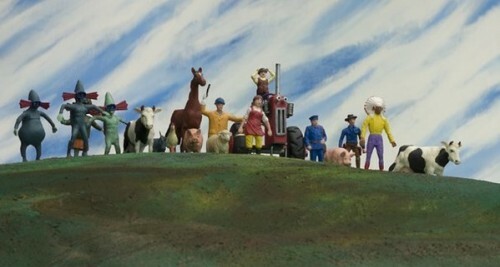 It will remind even the most logical audiences of a day where they used to believe their figurines were real and the world was filled with endless possibilities. The reason the town is called Panic is because everyone in this town really does panic at even the slightest of things. A morning shower can be entertaining simply because the characters get so worked up over who gets to go first. In Panic, the main characters are Horse, the father-figure in the house who has a crush on the local music teacher Madame Longray, Cowboy, the guy who always carries around a rifle, and Indian, the dude with the feathers and bow and arrow. Both Cowboy and Indian are extremely ADD, and will randomly disappear from a task to start playing ping pong or watch TV. 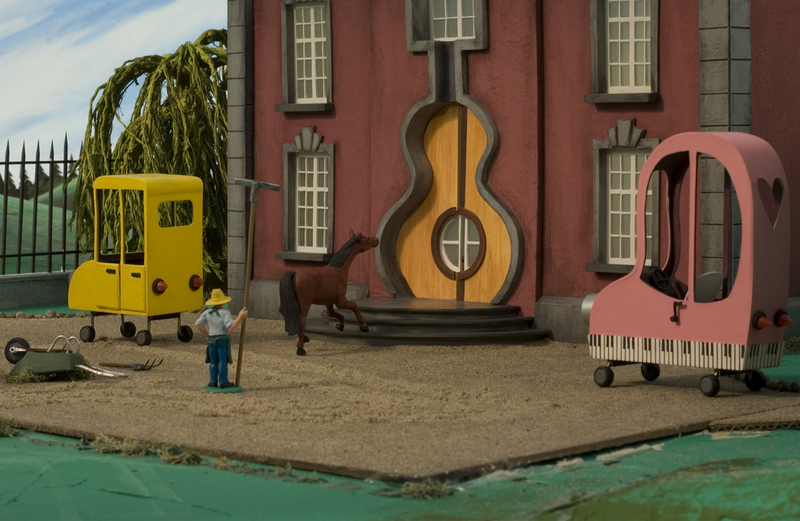 The village only has a few other recurring characters aside from these three: Madame Longray, a soft-spoken lady horse, Simon, the cleaner of the music school, Steven the farmer and his wife Janine, the Postman, the Policeman, and a bunch of farm animals. While Horse is probably more normal (if you can call it that), Cowboy and Indian have a strange charm in how little attention span or attention to responsibility they have. It takes us back to the time where not cleaning your room wasn’t as important as having fun, and that is their main focus: fun. The underlying love story between Horse and Madame Longray is very sweet, and all of the other characters have their own little nuances which make you love them. Aubier and Patar use claymation similar to that of Wallace and Gromit, but the characters don’t have changing facial expressions. Instead, when the characters talk it’s the body language which signals exactly how someone is feeling. The set is fully designed using materials such as clay and papier-mache and the time of day is shown using painted backdrops and lighting. While the character designs are simple, their animation is effortlessly charming and really shows how Aubier and Patar can be innovative without needing a big budget. The detail in the character’s movements – again, makes them look like they’re on crack – does really get across their emotions without needing to show facial expressions. Most of the characters even have their own style of walking – take Horse and Madame Longray. Horse has a slightly more masculine way of walking while Madame Longray’s movements are slightly more petite. The sets also show an incredible attention to detail: in one room, there was even a small fire extinguisher and in the music school there was a portrait of Mozart hanging on the wall. The movements aren’t perfect all the time, but they don’t need to be. The storyline, SFX, and sets really give audiences an entire fantasy world to get absorbed into. Half of the time, I wasn’t even looking at the character movements so much as I was trying to absorb in the world of Cowboy, Horse, and Indian. As I mentioned earlier, A Town Called Panic gets its name from the characters who literally panic at the smallest things. Steven, the farmer, in particular panics at every single thing from his chickens to greeting his wife. The over exaggerated voice acting really does suit the story and provides plenty of comedic relief when you realise that two figurines are yelling at each other because of an envelope. They also speak in French, which is even funnier as French is supposed to be the “language of love”. The SFX, like everything else in this film, are also detailed and really match what’s happening in the storyline. Considering that all the sound was added in, Panic’s sound effects really do seem like they were there from day one. The film uses so many different SFX: characters walking or bouncing around, fires starting, water drops, and brushing teeth. Aubier and Patar clearly put a lot of effort into selecting the right sounds for the right situations, and then went to the even bigger effort of syncing movement on screen to these sounds. A Town Called Panic is not one of those films which use thousands of different soundtracks to make the audience feel a certain way. The soundtrack here is really very minimalist, with music only featuring when it’s absolutely necessary, but the few songs which are used are definitely used appropriately and well. 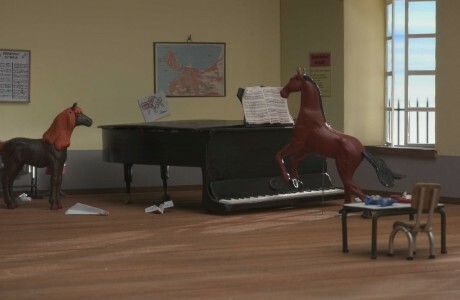 The music school where Madame Longray teaches utilises a lot of musical instruments and occasionally features a few songs, and at the parties in the film there is plenty of music to be enjoyed. In spite of this, the opening theme is by far the standout track for me: it really made me love the film straight from the get-go. For the most part though, Panic lets the characters, voice acting, and SFX do the talking. The DVD has a few hours of extras, which is great because it really lets you into the inside world of the film. If nothing else, The Making of Panic is definitely something which needs to be watched because it makes you appreciate the film that much more. I found that as soon as I finished watching Panic, I jumped straight to the ‘making of’ and before I knew it that was ending too. Also, the trailer is included in the extras and is definitely worth having a look at if you haven’t already. The other extras are nice to have, but some are a bit of a hit-and-miss. The Interview with the Directors feature was good for anyone who is extremely curious about the film but I found most of the information they talked about was already in the Making of Panic. The interview wasn’t filmed with a high quality camera which makes it difficult to watch. Extra Scenes was a bit disappointing; I was expecting funny gags but it was mostly one second clips which had been cut out, and Test Shot Comparison was really the one more worth watching between the two. There’s also a short film thrown in called Obsessive Compulsive, which was made by a 17 year old girl as an entry to a competition. It’s pretty cute, but I don’t think I would have missed it if it weren’t there. Overall, A Town Called Panic was a charming and funny film which took the world of the mundane and turned it into a world I only imagined was possible when I was a child. Anyone who played Cowboys and Indians as a kid or anyone who has a spark of a child still left in them should watch this because it’ll awaken that side of you once again. Even sceptics of claymation or fanboys-and-girls of CGI will find something to love in this film, and it is definitely worth watching at least once. This film is hilarious, imaginative, and unforgettable.